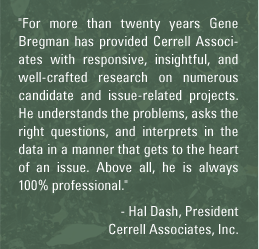 For more than thirty years, company founder Gene Bregman has conducted well over a thousand surveys on legislative and ballot issues, for candidates for elective office at nearly all levels of electoral politics, and on non-political subjects such as public policy research, business and consumer research, employee surveys, litigation consulting and in many other areas. He and his firm have conducted public opinion research in every state in the nation and throughout California. Clients have included governmental agencies, municipalities, public interest and community organizations, school districts, political candidates and private industry. One of the benefits of our experience is that in all our surveys, we make sure that we talk to the right people and ask the right questions. We are known for being on target with our results, and while our data, our interpretations and our conclusions are objective and unbiased, our advice is not. Clients who hire us should expect our interpretation of the data to help them make decisions that lead them to successful campaigns. Clients hire us to tell them if they can win and then to give them the advice that helps them do so. We believe that our clients get unbiased information and advice, and that we can maintain our perspective, because we conduct only the polling for campaigns. We do not run campaigns. Therefore, we do not have a vested interest in a measure being placed on the ballot. We are not reluctant to tell a client if the time is not right to hold an election and if more work needs to be done before asking a community to consider approving a measure that supports the client's efforts, especially if the measure will ask voters to approve a tax increase.